There are several cases which it will be usefull. 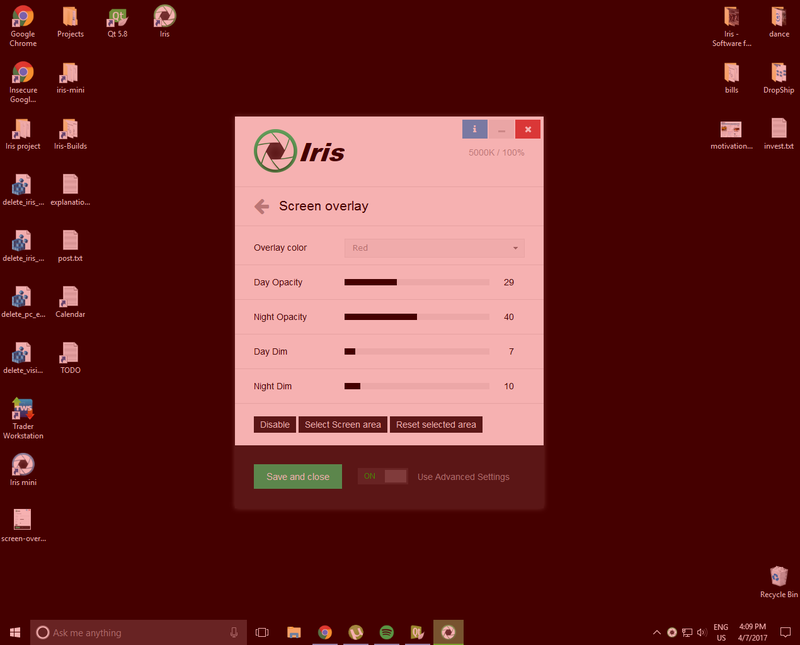 One of them is when your video card and monitor doesn’t support any color transformation changes and there is no other way to reduce the blue light emitted from the screen. 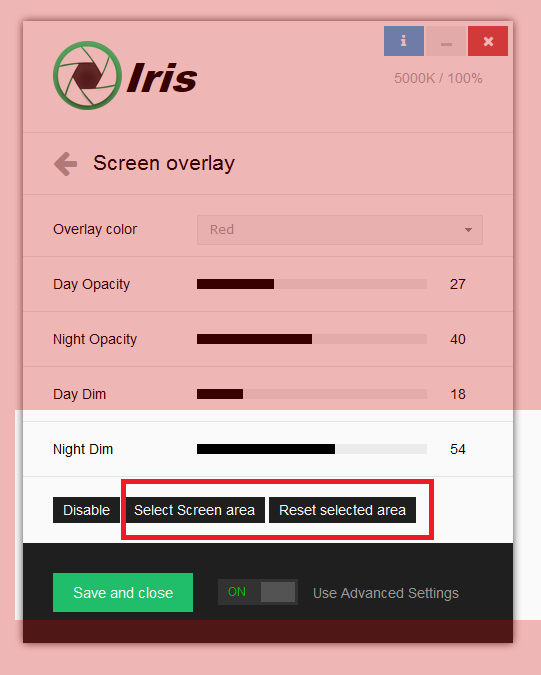 Second case is if you want only part of the screen to be with modified colors. One other case is also if you are into chromotherapy and color psychology. By using overlay with different colors you can change your mood as you like. 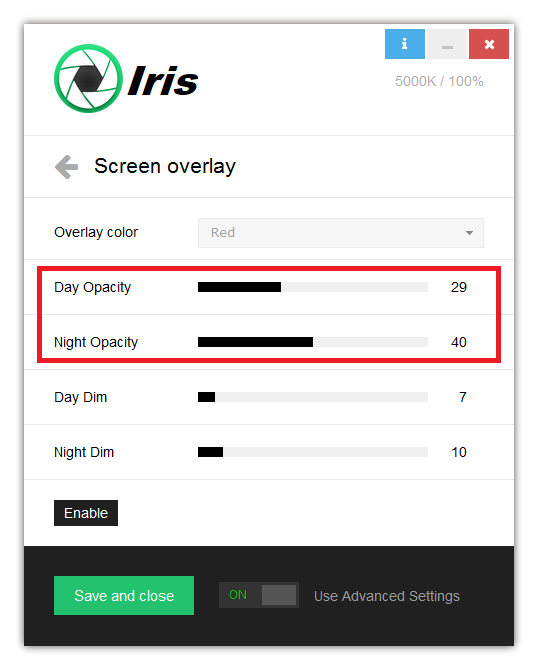 Screen overlay is also connected to the day and night just like the main Color temperature and Brightness features. During the day the day values will be used and during the night the night values. It will also decrease the blue light, but I just think that the 2 terms need to be separated. 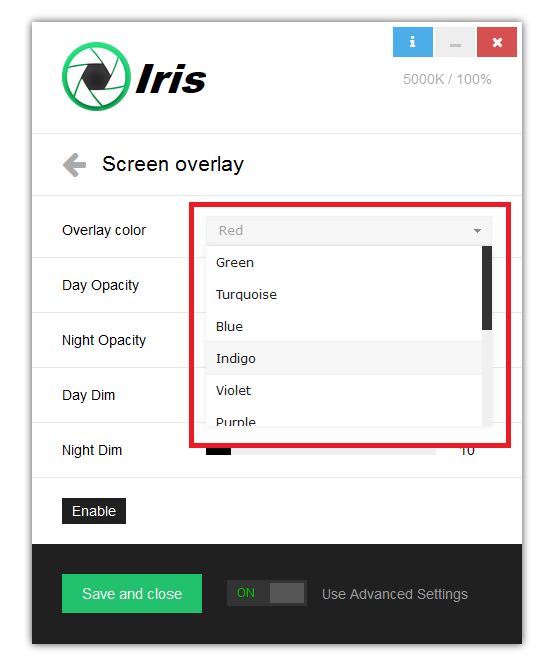 Many blue light reduction applications for Android which use similar approach call it Color temperature which is wrong. The creators of f.lux say that this approach is ineffective which is also wrong. 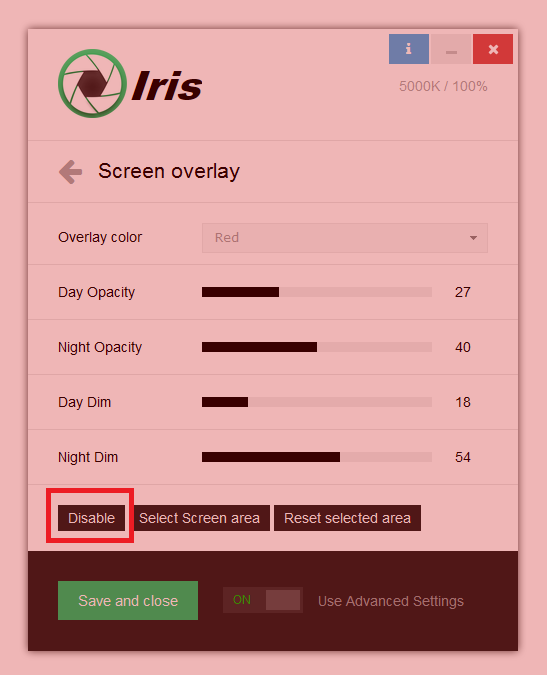 Placing red transparent overlay will reduce the blue light, but it just can’t be called Color temperature. 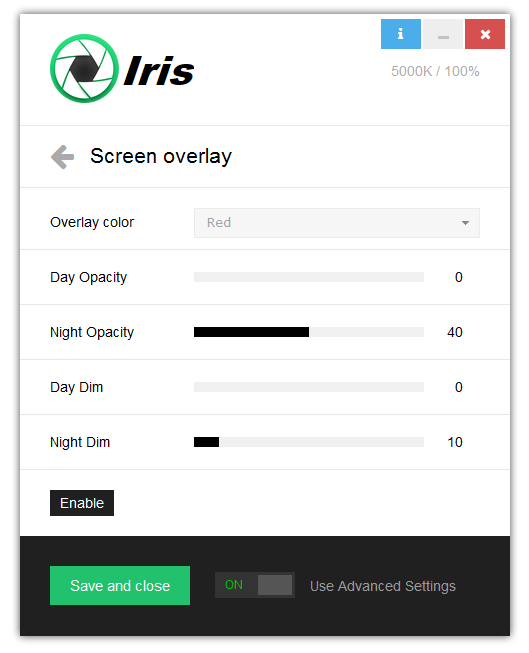 The bigger the value of the Opacity slider the more blue light will be removed from the screen. Think of Dim like brightness, but again this is not entirelly true, because this is dimming of the overlay. The effect is almost the same, but the screen is a little more ugly this way. 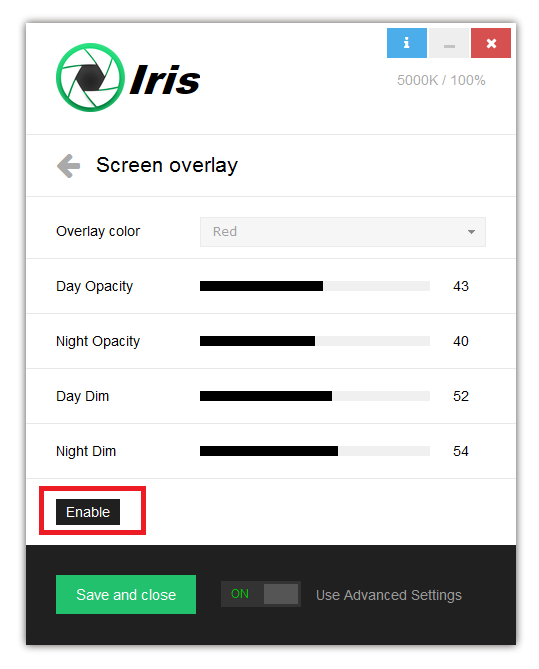 You can control the Screen overlay dimming by moving the Dim sliders. The lower the value the brighter the screen. 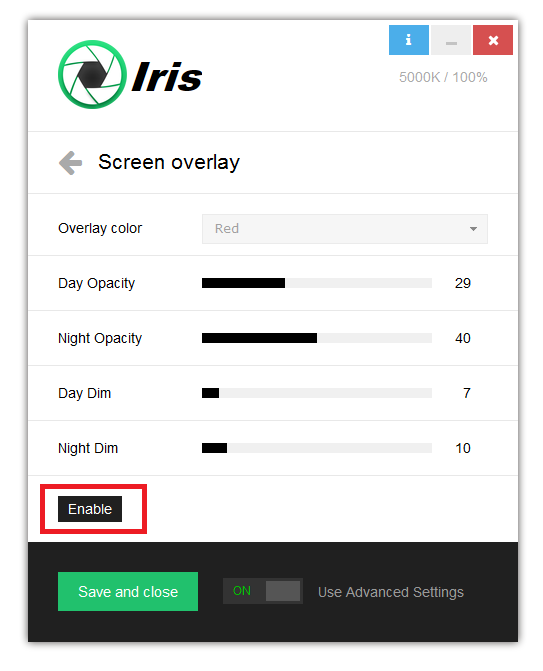 It’s important to note that Screen overlay is separate from Color temperature and Brightness of Iris which means that Screen overlay will stack over the current Color temperature and Brightness and in order to not see the native changes you need to set Color temperature and Brightness to maximum values. 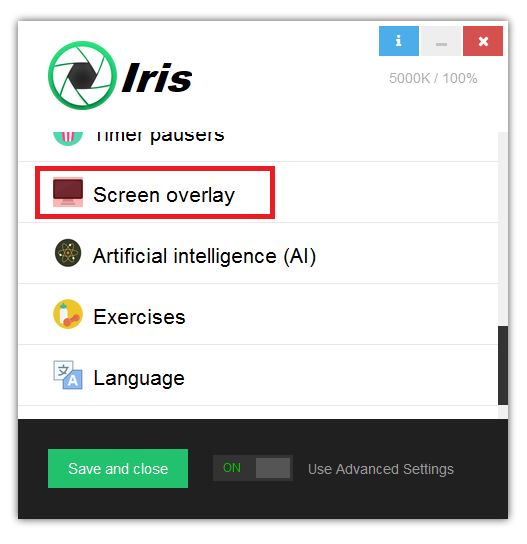 Use Screen overlay if your PC doesn’t support Iris native changes or if you want part screen color effects.